What is the Differences Between Dry Needling, Intra-Muscular Stimulation (IMS) & Acupuncture Needling into A-Shi points? Acupuncture, Pain Treatments, Physiotherapy, Resources. In the last few years, there has been a surge in the number of patients wanting to try dry needling, intra-muscular stimulation (IMS), and acupuncture needling to attempt to alleviate their symptoms such as pain. All these methods use needles, but they do vary in terms of what problems they treat and where the needles are inserted. Here is an overview of how various modes of treatment are different from one another. Dry Needling is a modern approach which began to develop in the US in the 1940s. The treatment uses sterile, one-time disposable acupuncture needles to gain relief from muscle pain and tightness by releasing myofascial trigger points. A myofascial trigger point or “knot” is a hyper-irritable spot in a taut band of skeletal muscle that is painful on compression, stretch, overload or contraction of the tissue. It usually responds with a referred pain that is perceived distant from the spot. The needle is inserted into the skin and muscle directly into and around a myofascial trigger point several times to elicit a local twitch response to release the “knot”. This is an involuntary spinal cord reflex in which the muscle fibres in the taut band of muscle contract, causing varying degrees of discomfort from a mild ache to a muscle cramp sensation. Patients are warned that the treatment soreness may last a few hours to a few days, and that occasional bruising can occur. Directly after treatment, certain clients may feel fatigued, energized or have a ‘release of emotion’. Generally, a trial of treatment is between 2-6 sessions, but it can vary depending on the cause and duration of the symptoms, and overall health of the patient. Sometimes, the origin of pain is the tight muscles next to the spine, that can cause the spinal nerves to be compressed as they exit the spinal cord, thus causing referred pain down the limbs, with or without peripheral trigger points. If this is the case, needles will be placed in the corresponding tight paraspinal muscles, in addition to the distally affected muscle/s. 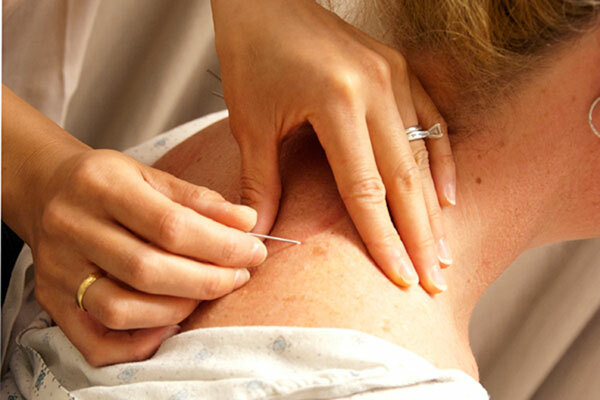 Acupuncture needles are inserted into A-Shi points to relieve symptoms. These points are painful when the physiotherapists uses his/her hands to examine the body (this process is referred to as palpation). A-Shi points are close to, or correspond with acupuncture points. Needles are generally left in for a certain number of minutes. Acupuncture stimulates the balance and flow of Qi energy that is rooted in Traditional Chinese Medicine. When the body is healthy, Qi flows smoothly through the meridians that make up a conceptual network of pathways throughout the entire body. When the balance or flow of Qi is deficient or obstructed, the body may become diseased or become more susceptible to illness. Western research has proven that the insertion of acupuncture needles into acupuncture points causes the body to release endorphins, which are our natural painkillers. Who would benefit from the above treatments? Client presents with a myofascial dysfunction (a condition where the muscles tighten up far quicker than they normally would) causing symptoms (with or without improper or compensatory movements). Client presents with tight musculature causing symptoms that have not responded to acupuncture or conventional physiotherapy. Client is not afraid of a more aggressive needling approach. Client is deemed an appropriate candidate for a quick release of tight muscles using these treatments. Client presents with referred (radiculopathy) symptoms, viz. symptoms down an arm or leg, and may benefit from these treatments. If you feel that you fall into one of these categories, please book an appointment to see a physiotherapist for an assessment and trial of treatment.